The Core courses are typically taken over the course of one academic year. 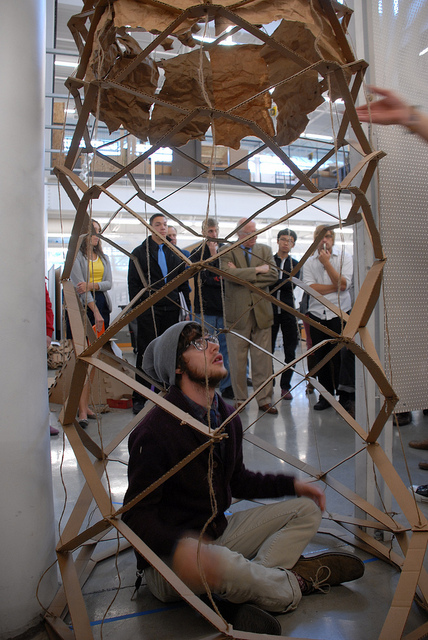 We recommend two Design courses in the fall and two in the spring. All students must take ENGL 150 or be placed directly into ENGL 250, which can be taken as a sophomore, prior to portfolio submission. Students who advance place into ENGL 250 (determined by ACT-E or SAT-V score) still must complete a total of 29.5 credit hours prior to applying to enrollment-managed programs. These credits may be counted as electives. * Required of all undergraduate students who enter the College of Design fall semester 2008 or later. Students who are part of the Design Exchange Learning Community take DSN S 110: Design Exchange Seminar I (1.0 credit hour) in place of DSN S 115. ** Students who intend to apply to the Architecture program are advised to take Math 145 and Physics 111 during their Core year. While these specific courses are not required to apply to the program, they are required to advance in the BArch program beyond the first semester. Students who intend to apply to the Industrial Design program are advised to take PHYS 101 and a math course during their Core year.